Skydivers are parachuting over shark-infested waters. As a rower in a lifeboat, can you rescue all of the skydivers? Move the lifeboat left and right to catch the skydivers. You score 1 point for every skydiver you successfully rescue. 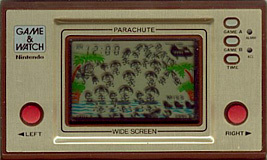 The number of skydivers increases (up to 10) as play progresses. When a skydiver falls into the water, he is attacked by sharks and you get a miss. If you get three misses then the game ends. Skydivers on the right side of the screen will occasionally get caught on a tree and swing there for a while before you can rescue them.